• Alfalfa meal is highly palatable to horses. It contains a high Carotene content. The horse converts Carotene to Vitamin A as needed. • Soy protein concentrate is rich in Amino Acids which are required building blocks of tissue. Soy protein concentrate also furnishes the amino acid Tyrosine which is a component of thyroid hormone and the neurotransmitter dopamine. Tyrosine is an essential Amino Acid and therefore must be available in the diet. Research performed at Life Data Labs in the 1970s - 1980s established the relationship of this nutrient with hoof problems and obesity related syndromes. Tyrosine supplementation is the natural means of regulating these syndromes, and has always contributed to the effectiveness of Farrier's Formula®. • Lecithin contains Phospholipids and Omega Fatty Acids which add strength and pliability to connective tissues, and are also critical for proper moisture balance. Skin, hoof and hair are connective tissues. • Yeast Culture is a rich source of B-Vitamins necessary for good metabolism and healthy dermis (skin, hoof and hair). • DL-Methionine is a sulfur-containing Amino Acid deficient in all commonly fed grains (corn, oats, barley, etc.). It is important for the proper utilization of lipids and building the sulfur crosslinks that add strength to connective tissue proteins. • Biotin is a highly active member of the B-Complex Vitamins. Biotin serves essential roles in Fatty Acid metabolism. • Vitamin C (Ascorbic Acid) supplementation is traditionally believed to be unnecessary in horses. However, research conducted by Life Data Labs established that stabled or stressed horses often have minimal blood levels of Ascorbic Acid and therefore benefit from supplementation. Vitamin C is required for healthy and strong connective tissue. • Silicon is an element utilized in the formation of connective tissue and bone. Research has shown that silicon supplementation strengthens bone, connective tissue, and has other beneficial effects when interacting with other nutrients. • Zinc is required for the healthy maturing of keratin - a major component of the outer layers of dermal tissue. Proper keratin formation is important for wound healing, skin health, and hoof structure. • Copper is an important component of a multitude of metabolic functions. A Copper deficiency leads to a number of abnormal conditions including defects in the pigmentation and strength of hair and hoof. • Calcium Iodate provides an easily utilized form of iodine. Iodine is a component of thyroid hormones which regulate basal metabolism. A deficiency of thyroid hormones is known as hypothyroidism and leads to a multitude of disease conditions including poor hair coat and hoof quality. Oxidation of nutrients is a primary cause of nutrient degradation resulting in loss of shelf life. The pelleting procedure reduces the surface area of nutrients exposed to the oxygen present in surrounding air, and packaging with nitrogen further reduces nutrient exposure to oxygen. The result allows Life Data Labs the unique ability to provide fresh product with an extended life of nutrient stability. *Farrier's Formula® Double Concentrate does not contain added sugars or molasses. The daily intake of starches, carbohydrates (WSC and NFC), and sugars from Farrier's Formula® Double Concentrate is very low, and is insignificant relative to the starch, sugar and carbohydrate intake in the total diet. Potassium in Farrier's Formula® Double Concentrate. 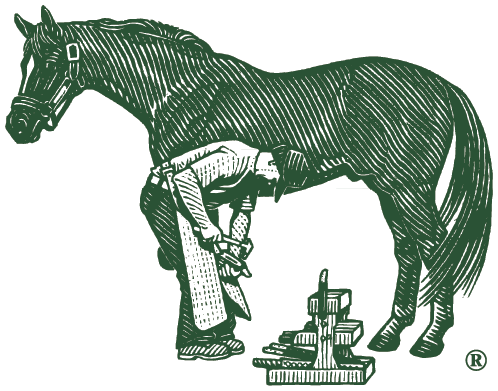 **Farrier's Formula® Double Concentrate does not contain added potassium; however potassium is contained in minor concentrations with some of the ingredients such as alfalfa. Considering the small amount of product, the total level of potassium intake from Farrier's Formula® Double Concentrate relative to the intake in the total diet is not significant. Farrier's Formula® Double Concentrate is doping free and can be safely fed to competition horses.